The invention relates to a pump intended to be immersed in a fluid, comprising: - an inductor (4) provided with guide vanes to make the flow of fluid linear; - a rotor (5, 16) comprising a central body with a flared shape, this rotor (5, 16) being disposed downstream of the inductor (4) with respect to the direction of circulation of the fluid; - at least one helical blade (18) provided around said central body; this helical blade (18) having a flared external profile and comprising turns with an increasing winding pitch that tends towards infinity, and the internal volume of the casing (6) being complementary to the flared shape of said at least one helical blade (18), - a casing (6) around the rotor (5, 16); - a diffuser (7, 22) provided with blades so as to make the flow of fluid linear and disposed downstream of the rotor (5, 16) so as to evacuate the fluid from the rotor (5, 16) towards the outside; and - a diffuser insert (8, 26) provided with blades and an outlet orifice with a diameter less than the inlet diameter of the diffuser insert (8, 26), the blades directing the fluid coming from the diffuser (7, 22) towards the orifice so as to increase the outlet pressure of the orifice. "Blood flow ventricular assist pump." The present invention relates to a pump for ventricular assist. This is for example a pump battery powered and intended to be inserted into a human body to assist in blood circulation. In the field of ventricular assist systems, there are two types of pumps: axial pump that generates a high flow with low pressure increase, and the centrifugal pump which generates high pressure with a low flow. To know what type of pump is most suitable for a given use, it is often necessary to estimate a specific rate of blood through the pump. The specific speed is reduced variable computed according to various parameters, the desired flow rate, the height of elevation (pressure difference between the inlet and the outlet) and the speed of rotation. 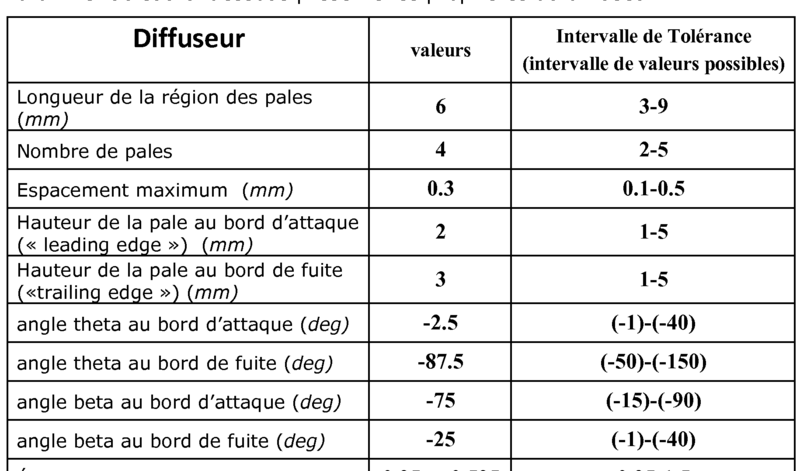 From this value, the pump selection may be made among the following modes: for a centrifugal speed in [0 to 1.2], mixed for a specific velocity in [1-2.2] and the axial -above. 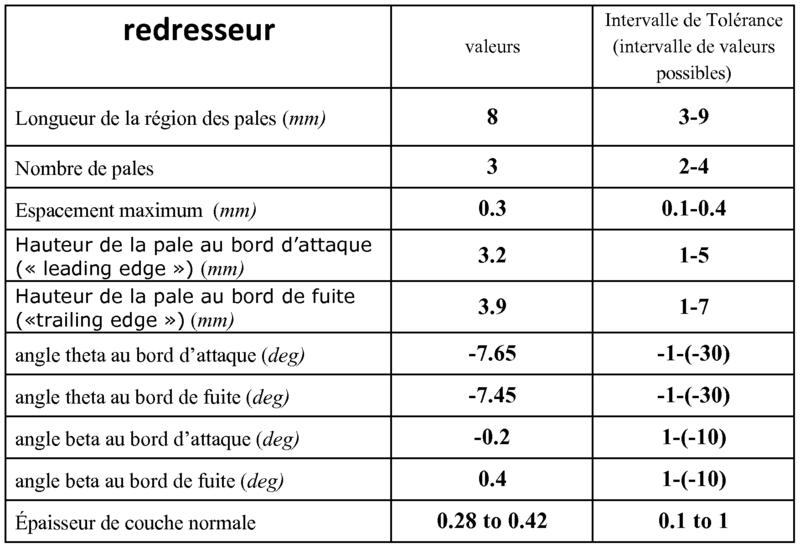 Nomograms are used to select a pump type with a predefined profile for the vanes or blades used in the rotor. Whatever type of pump chosen, there is the presence of shear forces in most pumps of the prior art that the rotors and casing used in the prior art create excessive vortices in the blood. Shear forces are behind the creation of hemolysis, that is to say, the destruction of red blood cells. When red blood cells are destroyed, whatever the flow to transport blood, oxygen does not reach the cells. Another drawback is the stagnation of blood causing blood clots, causing thrombosis. The present invention relates to a pump avoiding the creation of thrombosis. - a rectifier with blades and an orifice at the outlet of smaller diameter than the diameter of the rectifier input, the blades directing the fluid from the diffuser towards the aperture so as to increase speed and provide the fluid predetermined profile at the outlet of the orifice. In other words, the helical blade is wound around the rotor so that the angle of the helical blade decreases gradually as one moves from the upstream end of the rotor towards the downstream end; the angle being defined as the angle between the axis of rotation of the rotor and a vector tangential to the outer surface of the helical blade. Note that the blade may be wrapped around the rotor as described mainly in the present application, but it can also be positioned on the inner wall of the housing. The linear flow of fluid as defined herein, is opposed to a whirling flow. This linear flow may be laminar. The rectifier ( "straightener" in English) of the invention to create a flow by concentrating the fluid to obtain high speeds of output values ​​of the pump. In general, the vascular system of a heart this resistance vascular quite high. An effective pump is a pump capable of propelling the blood through the valves with sufficient pressure to overcome these vascular resistance. The outlet pressure of the pump is critical compared to the output speed with which the pump according to the invention can achieve maximum velocity of 3 m / s.
In other words, the rectifier allows to channel the fluid to create a profile allowing to have a maximum speed at a point, ie aligned with the aortic valve so as to expel the flow in a laminar manner. This avoids creating turbulence in the pump outlet. The diameter of the outlet is smaller than the internal diameter of the casing. Its small outlet diameter, for example a half or a third of the internal diameter of the housing, to adjust the pressure settings, between 80 and 200 mmHg, and speed, between 1 and 3 m / s, while avoiding the creation a current negative velocity (in the opposite direction by pressure and lack of uniformity of the output stream). The whole diffuser and rectifier according to the invention allows to make efficient pump. The rectifier distributes the fluid directly to the exit into the environment by creating a flow. This environment can advantageously be said fluid, which is preferably blood. The inductor according to the invention avoids the cavitation phenomenon, i.e. the creation of bubbles in the fluid. It is important to note that this pump is ideally suited for operation in vertical arrangement, or slightly tilted is to say, inclined at between 0 and 5 degrees with respect to the vertical axis. The pump of the invention can also function as lying most pumps of the prior art. On the helical blade, its outer contour is widened and the inner volume of the casing is complementary to the flared shape. In most pumps of the prior art, the housing has a cylindrical inner volume right so that the outer profile of the blades is more rectangular. These include axial pumps where the outer diameter of the blades is same as the inner diameter of the rectangular profile of the housing, they are isodiametric pumps. Such a rectangular profile design is not effective when the pump has to be disposed vertically. The pump according to the invention may further comprise an inlet chamber provided with lateral openings for the fluid to penetrate radially and then engage in the axis towards the inductor. This inlet chamber may be of cylindrical shape having on its upper part downstream of said openings, a receptacle to accommodate the inductor. The inlet chamber and the inductor can be two parts to be firmly joined to one another or be designed as a single piece. the inductor guide blades are preferably designed to pass a rod for connecting the rotor to an engine, the inductor located between the crankcase and the engine. In operation, the central body (with the helical blade) is rotated within the housing without coming into contact with the other components of the pump. According to an embodiment not limited to, the pump includes a total of four identical helical blades evenly distributed around the central body. Preferably, the central body of the rotor is oblong, that is to say that the flanks of the central body may have curvatures. The head of the central body may be rounded and devoid of blade, for example in the form of an ogive. According to the invention, the diffuser can be a hollow cylinder with straight guide vanes distributed in its inner wall and extending from the periphery towards the center. Its role is to convert some of the kinetic energy of the fluid pressure, which pressure is especially transferred to the rectifier. In addition in particular, the diffuser guide vanes may have a twisted shape in a direction reverse to the winding direction of the helical blade about the central body. According to an advantageous characteristic of the invention, when the central body comprises a rounded head devoid of blades, the diffuser cap this rounded head, and each guide vane of the diffuser has a shape complementary to a portion of the rounded head facing. The inner diameter of the cylinder forming the diffuser is the same as the internal diameter of the housing at the downstream end of the helical blade. According to the invention, the rectifier is disposed downstream of the diffuser in the direction of fluid flow. For example, the inner wall of the rectifier can be of conical shape with, arranged thereon, straight guide vanes. According to a variant of the dispenser according to the invention, the diffuser may comprise a central portion shaped pointed ogive downstream, a cylinder around the base of the ogive, the guide vanes connecting the cylinder to the base the warhead; the diffuser being designed to engage the downstream end of the rotor via a rolling bearing to keep the fixed diffuser relative to the rotor. Such a diffuser allows to improve the directivity, the pressure and the uniformity of the flow leaving the pump. Similarly, in this embodiment the diffuser guide vanes may also be twisted in a reverse direction to the winding direction of the helical blade about the central body. Thus the broadcaster objected to the swirling nature of the fluid from the rotor. After the passage of fluid in the diffuser, it is completely corrected so as to form a laminar flow by the action of the rectifier. In particular, according to the variant, the rectifier is disposed downstream of the diffuser in the direction of fluid flow; guide vanes are straight and are designed so as to allow to enter the head of the warhead in the central part of the rectifier. Generally, the rotor assembly and a helical blade can advantageously have a centrifugal-type profile on the upstream side, of mixed type in the central portion, and the downstream side axial kind. - an axial type pump, the fluid being led in a direction parallel to the axis of rotation of the rotor. This configuration limits the shear forces ( "shear stress" in English) that can cause hemolysis, that is, the destruction of red blood cells. Even with a strong flow, when red blood cells are destroyed, oxygen fails to cells. The shear forces are created by blood swirling effects input and pump output. The pump according to the invention avoids the vortices by a call from blood using a centrifugal type structure and an axial outlet. According to an advantageous characteristic of the invention, the portion of the upstream side of the assembly and central helical blade body is dimensioned to a specific speed between 0 and 1.2. Furthermore, the central part of the whole central body and helical blade may be sized to a specific speed between 1 and 2.2. Finally, the central part of the assembly and central helical blade body may be dimensioned for a specific speed greater than 2.2. This is specific speed value for classifying the centrifugal, axial or mixed structures respectively. At the preliminary theoretical study before conception, depending on usage and objectives in terms of throughput to achieve, it was found that the pump according to the invention should have a specific speed of about 1. The graphs in the technical field of the invention and the commonly accepted prejudices naturally have pushed the art to a choice of pump or centrifugal or axial type turbine. However, the pump of the invention has a very special and innovative design where the three pump types are present, including the mixed type. The structure of the pump according to the invention does not follow the traditional method ( "Handbook") drawing of a pump or homogeneous type turbine. According to an advantageous characteristic of the invention, the pump comprises a drive shaft and holding the rotor, said shaft being fixed to the upstream end of the rotor and passing through the inlet chamber in its axial region. This shaft is in particular connected to a motor adapted to set in motion the rotor. According to the invention, the inlet chamber, the inductor the housing and the diffuser are designed in one piece or are firmly fixed to each other without relative movement, the rotor being movable rotatably held in the housing. The inductor in the inlet chamber, the diffuser and the rectifier are also fixed elements with respect to the rotor. Preferably, the helical blade has a radial height (thickness in the radial direction) that is identical along its entire length (from bottom to top of the central body). Alternatively, it is conceivable preferably a radial height (thickness in the radial direction) variable along its length. There may be a height of 1 to 4 mm at the bottom and 1 to 3 mm above the central body, with a continuous or stepwise progression, depending on the pressure characteristics and speed needed. The outer overall shape of the pump is a cylinder of circular section, but other types of sections may be envisaged such as square, triangular; the intake chamber may have a different overall shape of the overall shape of the housing. According to another aspect of the invention, there is provided a method of controlling the pump as defined above. In this method, the rotor is actuated by a motor connected to the pump in accordance with the heart rate. Blood is drawn out of the pump according to the rhythm of the heartbeat, especially with sinusoidal accelerations and decelerations. The heart rate may be detected using a probe connecting the heart to a control unit which controls the engine. The pump fits into rotation: If the heart beats at 60 beats or 120 beats per minute, the pump of the invention follows the rhythm while most pumps of the prior art operates at fixed speed. Figure 20 is a schematic sectional view of a blade with an illustration of different parameters. In Figure 1, the pump 1 can be distinguished according to the invention in the overall shape of a circular section cylinder, for sucking a fluid such as blood and discharging so as to promote blood circulation. Such a pump is to be installed in a body including ventricular assist. Has a length of about 61.8mm, the diameter of the housing 2 is about 17-20 mm, while the lower portion 3a has a diameter of about 15-20 mm. The pump according to the invention may advantageously, but not exclusively, be used in a vertical position, that is to say the housing 2 vertically and above the bottom portion 3a. Most pumps of the prior art are used in a horizontal mode. According to the invention, the intake chamber 3 has the function of bringing the fluid, in particular blood, by 3d louvers or apertures under the action of suction from the interior of the housing 2. The fluid is then discharged through an opening at the end of the housing. In Figure 5 it can be seen in more detail the inlet chamber 3 comprises a bottom part 3a, an upper portion 3b, the two parts being connected by radial guides 3c 3d defining openings inwardly of the inlet chamber. The lower part 3a is a cylinder of circular section, thick wall so that the central portion is a third tunnel. The diameter of the latter is smaller than the outer diameter of the cylinder section, which is about 15mm. In the example of Figure 5, the third tunnel diameter of 6 mm. The radial guides 3c are three plaques inscribed in planes that intersect on the axis of the inlet chamber. The outer face of each plate 3c is flush with the lateral outer surface of the upper part 3b. The central zone containing the axis of the inlet chamber is empty for the passage of fluid. This central zone is a tunnel of greater diameter than the diameter of the third tunnel. The upper portion 3b is in the form of a cylinder having two different thicknesses, a first thickness at the upstream side, that is to say on the side in contact with the radial guides 3c, and a second thickness less than the first, the downstream side. Between the two layers is a step 3f. With such an arrangement, an inductor 4 as described in Figure 6 can be inserted and fixed within the inlet chamber 3 into the portion 3b of great thickness. Upon insertion, the inductor 4 can come to rest on the ends of the guides 3c. The dimensions of the inductor 4 are such that, once inserted, its upper portion is flush with the walking 3f. One can envisage other embodiments such as for example a single piece composed of elements 3b and 4, or else 3 and 4. The inductor 4 is a hollow cylinder having radial guides 4a, for example four in number until to six, over the entire height of the cylinder and fitting in radial planes intersecting the cylinder center. The inductor 4 is used as input to guide the fluid. It limits cavitation in the upper floors which will be described later. The guides 4a produce a laminar flow so that the turbulent nature of the fluid is significantly reduced. This will slow down and reduce the usually rapid deterioration of the rotor which will be described below, limiting attacks of fluid on the blades of the rotor. Figures 2 and 3 are distinguished by transparent interior view and in exploded view the individual parts of the pump. The view of Figure 2 to distinguish one cavity 3g greater than that of the third tunnel diameter. The upper floors of the inlet chamber comprises a rotor 5 for moving inside a housing 6, and output devices, such a diffuser 7 and a rectifier 8. The rotor 5 shown in FIGS 2, 3 and 4 has an oblong or oval shape with a single axis of symmetry that is to say as an elongated ogive or stretched over one end. The rotor 5 is a body of which the diameter of the circular section (radial cross section) increases from its lower part up to the upper part, and then decreases rapidly to the top end. We can define a useful part as that for which the diameter increases. This growth is preferably continuous but non-linear so that the outer shape of the working portion is of conical type convex wall. 2, there are four helical blades 5a, 5b, 5c, 5d on the useful part. Each helical blade is a constant or variable thickness over the entire coil length so that the outer shape of the rotor with the helical pitch blades scalable remaining tapered convex wall. The innovative shape of the rotor 5 has an upper part hemispherical 5h and the useful part, the latter being pre-cut into three parts: a (first) bottom part 5e, the characteristics (shape, angle of attack, blade pitch , ...) are those of a centrifugal pump. In a centrifugal pump the pumped fluid is sucked in axially and radially accelerated, and finally discharged tangentially. In this case, the fluid is supplied axially through the inlet chamber and is accelerated radially by the pronounced curvature of the bottom of the rotor. This sharp curve is obtained using abacuses known to the skilled person such as charts published by Sabersky, Acosta and Hauptmann in 1989 ( "Fluid Flow: A First Course in Fluid Mechanics" by Rolf H Sabersky, AJ Acosta. and Edward G. Hauptmann, 3 Sub edition, March 6, 1989 Prentice Hall College Div) or Stepanoff A. (Stepanoff A., "Centrifugal and Axial Flow Pumps", 2nd ed, 1957, New York. Krieger Publishing Company) . The centrifugal force is made optimal by the fact that the housing 6 also has a concave conical interior shape complementary to the shape of the rotor 5 of the useful portion. The second part 5f is mixed form according to the graphs. This is an intermediate portion in the centrifugal part and having a curvature less pronounced than that of the centrifugal part or then a plane inclined relative to the axis of rotation. The third portion 5g is axially form the outer shape of the rotor and the inner shape of the casing are substantially linear and parallel to the axis of rotation of the rotor. In Figure 8 we see in detail such a rotor. A not shown shaft is provided as rod fixed in the rotor axis. In operation, the shaft connecting the rotor 5 to a motor not shown, the shaft passing through the inlet chamber. Rotated, the shaft rotates without contacting the walls of the inlet chamber. For fastening, the shaft and the rotor can be designed in a single piece, or the shaft may be inserted into the rotor 5 through the bore 5i visible in Figure 4. Figure 7 is distinguished in greater detail the casing 6 consists of a main body 6a and a secondary body 6b. The main body 6a is an elongated cylinder, the secondary body being a cylinder whose outside diameter is smaller than the outer diameter of the main body. The secondary body 6b is shaped so as to fit and be held fixed in the upper part 3b of the inlet chamber. Preferably the lower end of the secondary body 6b abuts on the step 3f, visible in Figure 5. The inner shape of the casing 6 is complementary to the outer shape of the working portion of the rotor over the entire length of the helical blades. An upper housing part by this against a uniform inside diameter so that it is a conventional hollow cylinder of circular section. At this upper part, inside the casing, there is the head 5 in the rotor and the diffuser 7 and the stator 8. In operation, the complex internal shape of the housing allows for centrifugal functions, mixed and axially so that the fluid is sucked into the pump without creating a vortex, it is then propelled toward the top of the pump without shear not to destroy red blood cells. The rotor according to the invention allows to provide the kinetic energy to the fluid due to its particular shape. So it changes the speed of the fluid without shear and also increases its pressure. To do this, the outlet of the pump elements contribute to the increase in pressure having an outlet reduced and specific shapes. In Figure 10, there is shown a rectifier 8 whose role is to guide the discharge of the fluid by creating a laminar flow in order to eliminate turbulence. This is an open cylinder 8a on its base for receiving the fluid from the rotor 5 via the diffuser 7. It comprises an orifice 8b of smaller diameter relative to the diameter of the opening 8a on its base. There are an inner wall 8d of concave conical shape from the opening 8a on its first half and convex conical on its second half 8b to the orifice. The fluid is pressurized when pushed to the small diameter orifice. It also distinguishes three guide vanes 8c listed in radial planes which contribute to the center of the rectifier. Each blade has a thicker width of the blade side of the wall than on the side of the cylinder center. The width is thus affine away from the cylinder wall. In the described configuration, for each guide blade, the profile of the side facing the axis of rotation of the cylinder, is curved, in particular circular arc, so that the guide blades are approaching each other to the orifice and are furthest from the side of the opening 8a. A variant of the rectifier may be designed in a concave manner with the blades after the concave inner portion of the rectifier and the thickness of which widens towards the end linearly 8b. This variant allows the rectifier to marry the shape of the portion 5h in Figure 4 or ogive 24 'directly fixed to the rotor of Figure 14 or of the nose 24 of the diffuser of Figure 12 according to another variant. In Figures l ia, 11b and 11c shows a variant of the pump according to the invention. This variant is particularly suitable for effectively disseminating the blood out of the pump. The characteristic of this pump is a diffuser 22 arranged at the end of the active area of ​​the rotor 16 by means of a bearing 21. This feature is illustrated in Figure l ia together with other pump components, these components being different from those described in the other figures but we can naturally consider using components already described insofar as they are compatible with this feature. More generally, there are a turbine housing 12 which is a cylindrical part with lateral openings 13 for the blood inlet. Those skilled in the art will readily understand that the turbine housing made combines the functions of the housing, the inlet chamber and the inductor described above. This turbine housing 12 can be designed either in a single piece which includes the inductor is this box can be created in two separate parts to which the inducer can be added. In other words, there may be a single piece or three separate parts such that the lower portion 14 which includes the portion 13, the inductor and the part 15 as shown in Figures 5, 6 and 7. the side openings 13 allow to distinguish an upper portion 15 of the highest caisson a lower portion 14. the upper portion 15 is hollow for receiving the rotor 16 and its drive shaft 17. the latter is intended to pass through the lower portion 14 through its center to a motor 10a. In other words, the motor 10a keeps the drive shaft 17 that runs through the lower part 14 to the rotor 16 and to which it is firmly secured to drive it in rotation. The motor 10a can be partially or fully integrated with the end of the lower portion 14, but it can also be disposed outside. A seal 11 is provided inside the lower part 14To a seal between a bearing 10b, the motor 10a and the blood. In all cases, this seal 11 is located before the after portion 13 and a bearing 10b which is not shown here and which serves for guiding the drive shaft 17. This bearing 10b can be in the lower part 14 or in the motor 10a. The upper portion 15 is long enough to accommodate more of the rotor 16, the bearing 21, the diffuser 22 and the rectifier 26, these elements being connected in series. The rotor 16 consists of a central flared body 19 around which are wound four helical blades 18 over the entire length of the central body. The rotor head is cut off flat, only one pin 20 protrudes. In Figure 15, we see in more detail the rotor 16 according to the variant of FIGS ia, 11b and 11c. It is noted that the thickness of the blades 18 is not constant along the central body 19. The tapered shaft 20 is a male rod dimensioned to receive the bearing 21 as part female. The outer ring of the bearing 21 is tightly fitted in the housing 29, 13 of the diffuser 22 which is itself fixed within the portion 15 of the housing 12. The axis 20 of the rotor 16 is mounted sliding in the inner bearing race 21 thus allowing the guiding in rotation of the rotor as well as the bearing 10b of the motor 10a. The rectifier 26 is fixed in the upper portion 15 of the casing 12, as well as the diffuser 22. This is a hollow cylinder with straight blades arranged radially. When the pump is fully assembled, the rectifier 26 is flush with or set back (inside) of the end of the upper portion 15. together with the engine makes a length of less than 100mm. In operation, the 10a type "brushless" motor rotates the assembly 16 which is composed of parts 17 to 20. The blood enters through the openings 13, then passes through an inductor (not shown) disposed within the housing 12. This inductor may be in the form of a plurality of blades radially straight guides fixed to the internal wall of the box 12, "at the foot" to the upper part 15. the blood is sucked through the rotor 16 and pass around the drive shaft 17 as a linear flow. The blood is then driven by the rotor by turning into the diffuser which carries blades twisted in the opposite direction to the direction of helical blades. Blood flow then stops rotating and is then rectified through the rectifier 26 which by its outlet creates a laminar flow pressure. The pump is designed to operate immersed in a frequency ranging from 500 to 10,000 rev / min. In Figures 11b and 11c, there are inside the turbine casing 12 shaped so as to accommodate the various components. The upper portion 15 comprises inside a flared shape from wedding, without touching, the outer shape of the rotor 16. The blades 27 are directly formed on the internal wall of the casing, thereby forming an inductor at the upstream end of the upper part 15 . the openings 13 are directly carried out in the chamber so that only the blades 28 remain registered in competing planes to the axis of revolution of the housing. The drive shaft 17 is provided along the case axis of revolution as shown in Figure 11b. The fluid is intended to penetrate radially through the openings 13 and to be driven around the drive shaft 17 in the direction of the rotor, between the helical blades up through the diffuser 22. The rectifier blades may also be directly formed on the inner wall at the downstream end of the upper portion 15. The gasket 11 of Figure 11b prevents fluid from down to the motor 10a. In the example illustrated in Figure 11b, the bearing 10b is integrated into the motor 10a which itself penetrates into the lower portion 14. Figures 11b and 11c are variants in which the inductor and the rectifier are made directly in the caisson. 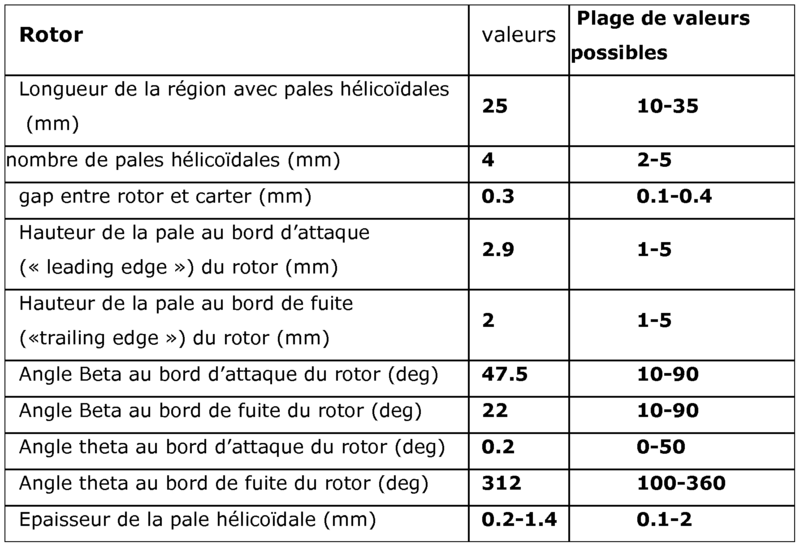 rotor dimensions may be as shown in the table below. The angles of attack and output of blood into the rotor are such that the blood is propelled at the inlet by a centrifugal force, and is released at the output by an axial force, the rotor central zone being similar to a joint force . It is noted that the height of the helical blade (thickness in the radial direction) may vary, for instance decrease between the bottom and the top of the rotor. Moreover, the lateral thickness of the helical blade may also be varied, e.g. grow between the bottom and the top of the rotor. The height "a" and the lateral thickness "b" are shown schematically in Figure 14. The same dimensions can be applied to various embodiments. In Figure 12 is illustrated in greater detail a diffuser 22 according to the invention. It consists of a cylinder 23 connected to an ogive 24 with twisted blades 25. In Figure 13 one distinguishes the rear of the diffuser 22. It is noted that the nose 24 has on its rear face 29 housing for receiving the bearing 21 and the axis 20. Figure 14, shows another variant in which the nose 24 'is integrated and rotates with the rotor. In this case, the diffuser is constituted by a cylinder as the cylinder 23 but with twisted blades only attached to the cylinders and allowing the passage of the head of an ogive with a margin of thickness to avoid friction. In Figures 16 and 17, a schematic representation is distinguished from a single inductor 34 of Figure 16 and a schematic representation only the blades 35 of the inductor in Figure 17. This inductor can be designed individually. It will then be firmly set in an intake chamber. It can also be carried out directly in a chamber inlet or in a turbine casing; in this case these are the blades which are formed on the inner wall of the inlet chamber or the turbine housing. The central area of ​​the inductor is left free for the passage of fluid. In Figure 17, the central region of the inductor shows the flow of the fluid. The sets U, V and W represent flow velocity triangles and serve as reference for the definition of velocity vectors and angles 3 m and Q m, where m is equal to 1 for the coordinate whose origin was moved to edge, and 2 to the mark whose origin has been moved to the trailing edge. The dotted line represents the axial direction. Figures 18 and 19 illustrate a front view and a rear view of a rectifier according to the invention. This rectifier may be carried out individually and then fixed in the housing of the pump or directly formed on the internal wall of the casing, that is to say an identically shaped wall to the inner wall of the cylinder 30 of the rectifier and blades designed directly on this wall. The blades 31 are thicker upstream and downstream in the direction of fluid flow. The increase in thickness may be linear. In Figure 18 is shown the downstream side of the rectifier, it is-to-say the place in which the fluid exits. Figure 19 is illustrated the upstream side of the rectifier, the fluid inlet. On the latter side, the blades 31, leaving a central space larger than the downstream side, the blades and the inner wall 32 of the cylinder 30 carrying the blades being arranged to guide the fluid towards the outlet 33 which is narrower than the input of the rectifier. Of course, the invention is not limited to the examples just described and numerous adjustments can be made to these examples without exceeding the scope of the invention. The pump according to the invention can easily be implanted in a heart by its small size due to its special design allows a high pressure while maintaining the quality of blood. The pump according to the invention consumes little because it works on the physiological cardiac rhythm: an oscillating flow. The pump of the invention operates by propelling: rhythm is tapped. The pump according to the invention is advantageously designed to operate vertically, the rotor being disposed vertically, the fluid penetrates via the inductor, through the rotor and out through the top through the diffuser and the rectifier. Most pumps of the prior art works horizontally. This is the input capacity and discharge allows operation in the vertical pump according to the invention. Such a pump, placed in a left ventricle for example, presents the advantage of having an input and an output directly into the ventricle. This avoids the presence of an inlet tube and / or output as it exists on the other devices of the prior art. - a rectifier (8, 26) having blades (8c) and an orifice (8b) at the outlet of smaller diameter than the inlet diameter of the rectifier (8, 26), the blades (8c) conducting the fluid, from the diffuser (7, 22) to the orifice so as to increase the speed and to give the fluid a predetermined profile at the outlet of the orifice. 2. Pump according to claim 1, characterized in that it further comprises an intake chamber (3) provided with lateral openings for the fluid to penetrate radially and then engage in the axis towards the inductor ( 4). 3. Pump according to claim 2, characterized in that the inlet chamber (3) is of cylindrical shape comprising on its upper part downstream of said openings, a receptacle to accommodate the inductor (4). 4. A pump according to any preceding claim, characterized in that it comprises a total of four helical blades (18) identical evenly distributed around the central body. 5. A pump according to any preceding claim, characterized in that the central body of the rotor (5, 16) is oblong. 6. Pump according to any one of the preceding claims, characterized in that the head of the central body is rounded and devoid of blade. 7. Pump according to any one of the preceding claims, characterized in that the diffuser (7, 22) is a hollow cylinder with straight guide vanes distributed in its inner wall and extending from the periphery towards the center. 8. Pump according to any one of claims 1 to 6, characterized in that the diffuser (7, 22) is a hollow cylinder having, distributed in its inside wall of twisted guide vanes (7a) in a direction opposite to winding direction of the helical blade (18) around the central body. 9. Pump according to claim 7 or 8, characterized in that when the central body comprises a rounded head devoid of blades, the diffuser (7, 22) cover this rounded head, and each guide vane of the diffuser (7, 22) has a shape complementary to a portion of the rounded head facing. (7, 22) in the direction of fluid flow; the inner wall of the rectifier (8, 26) being conically shaped; guide blades (8c) being disposed on this straight inner wall. 11. A pump according to any one of claims 1 to 4, characterized in that the diffuser (7, 22) comprises a central portion shaped pointed ogive downstream, a cylinder around the base of the ogive , guide vanes (7a) connecting the cylinder to the base of the ogive; said diffuser (7, 22) being adapted to engage the downstream end of the rotor (5, 16) via a bearing to keep the diffuser (7, 22) fixed relative to the rotor (5, 16). 12. Pump according to claim 11, characterized in that the diffuser guide blades (7, 22) are twisted in a reverse direction to the winding direction of the helical blade (18) around the central body. 13. Pump according to claim 11 or 12, characterized in that the rectifier (8, 26) is arranged downstream of the diffuser (7, 22) in the direction of fluid flow; guide vanes are straight and are designed so as to allow to enter the head of the warhead in the central part of the rectifier (8, 26). 14. A pump according to any preceding claim, characterized in that the rotor (5, 16) and helical blade (18) has a centrifugal-type profile on the upstream side, of mixed type in the central part, and axial downstream side like. 15. A pump according to any preceding claim, characterized in that the upstream side portion of the entire central body and helical blade (18) is sized to a specific speed between 0 and 1.2. 16. A pump according to any preceding claim, characterized in that the central part of the assembly and central helical blade body (18) is designed for a specific rate of between 1 and 2.2. 18. A pump according to any preceding claim, characterized in that it comprises a shaft (17) for driving and holding the rotor (5, 16), said shaft being fixed to the upstream end of the rotor ( 5, 16) and through the inlet chamber (3) in its axial region. 19. A pump according to any preceding claim, characterized in that the inlet chamber (3), the inductor, the casing (6) and the diffuser (7, 22) are designed in one piece (12 ) or are firmly fixed to each other without relative movement, the rotor (5, 16) being movably held in rotation in the casing (6). 20. A pump according to any preceding claim, characterized in that said at least one helical blade (18) has a radial height identical over its entire length. 21. A pump according to any preceding claim, characterized in that said at least one helical blade (18) has a variable radial height over its entire length. EP0677148A4 (en) 1997-05-28 Pump impeller and centrifugal slurry pump incorporating same.